Other studies interpreted as inhibition of dopamine transporter moving dopamine from storage to available pools examine the rate of decrease of dopamine after the combination of an antipsychotic drug and an inhibitor of the dopamine transporter. Neither drug by itself causes a loss of tissue dopamine. However, a combination causes a substantial loss in tissue dopamine, reaching values of 50% by 90 minutes after drug administration [50,51]. Such studies have been interpreted as moving dopamine from a storage pool where it is protected from metabolism to an available pool where dopamine can be metabolized. Results from our simulation studies suggest that the non-protected compartment into which dopamine is moved by the combination of inhibition of dopamine transporter and antipsychotic drug is the extracellular compartment. 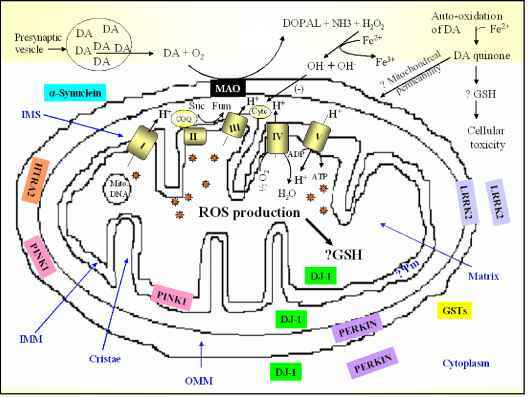 While most of the dopamine entering the extracellular compartment is captured by dopamine transporter and recycled, a small fraction is lost either through metabolism or uptake into glial cells. Under normal conditions, this small fraction that is lost is replaced by ongoing dopamine synthesis. However, in the presence of the combination of inhibition of dopamine transporter and an antipsychotic drug, this fraction of dopamine lost from extracellular space exceeds rate of dopamine synthesis, resulting in the loss of total dopamine in the varicosity. The following three paragraphs will explain how this occurs. Typical antipsychotic drugs such as haloperidol induce substantial changes in striatal dopamine turnover (Table 1). These drugs increase the rate of dopamine synthesis and increase the rate of dopamine neuron firing. In addition, our simulation data suggest that the majority of newly synthesized dopamine stimulated by these drugs is immediately converted to DOPAC and that rate of DOPAC metabolism is decreased. Extracellular dopamine is increased as a result of the increase in firing rate. As there is excess dopamine transporter capacity, the excess dopamine is cleared rapidly, which minimizes increases in extracellular dopamine. However, the relatively modest increase in extracellular dopamine has an impact on dopamine turnover in the varicosity as the rate of loss of extracellular dopamine is increased in proportion to the increase in extracellular dopamine. In addition, a significant fraction of cytosolic dopamine arrives into cytosolic compartment via movement from extracellular compartment mediated by dopamine transporter. Rate of metabolism of cytosolic dopamine also increases proportionally to increases in extracellular dopamine. In the case of antipsychotic drugs, the increase in dopamine synthesis producing dopamine for storage and signaling balances the increase in metabolism of dopamine. Therefore, there is no net change in total dopamine in the varicosity. Table 1. Effects of haloperidol and amfonelic acid on various measures of dopamine, DOPAC, and their synthesis and metabolism. Conclusions were derived from the following: [50,51,67,78,79]. The major effect of inhibition of dopamine transporter is to increase extracellular dopamine. This occurs as the drug competes with dopamine for occupancy of the transporter. Another effect of drugs that inhibit dopamine transporters is to slow dopamine neuron firing rate. This action decreases rate of dopamine secretion into extracellular space. This lessens the extent to which extracellular dopamine is increased by inhibition of dopamine transporter. Although the increase in extracellular dopamine does increase rate of loss of dopamine (as discussed in the previous paragraph), the increased loss over the duration of action of a drug would be a small fraction of total dopamine in the varicosity and might not be detected in biochemical measurements. Our strategy for simulating effects of the combination of inhibition of dopamine transporter and antipsychotic drug was to preserve the inhibition of dopamine transporter (effect of dopamine transporter inhibitor) and the increased rate of dopamine synthesis with the majority of this increase converted immediately to DOPAC (effect of antipsychotic drug). We then varied the firing rate until our simulation output matched published experimental data. 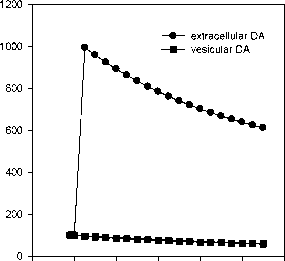 The simulation output showed a large (6-fold over control) increase in extracellular dopamine (Figure 8). Analysis of rate of dopamine entering and exiting the extracellular compartment during the initial five seconds after the combination of drugs was imposed on the system (Table 2) shows that the combination of increased firing rate (10 Hz as compared to a control of 5 Hz) coupled with inhibition of dopamine transporter accounts for the large increase in extracellular dopamine. We then looked at rates of addition of dopamine to and removal of dopamine from the system (Table 3). We note that, with the combination of drugs, the amount of dopamine disappearing from extracellular space via mechanisms other than captured by the dopamine transporter substantially exceeds the rate of synthesis of new dopamine. This accounts for the net loss of dopamine from the system. In summary, the redistribution of dopamine by the combination of inhibitor of dopamine transporter and antipsychotic drug from a protected to a non-protected compartment appears to be movement from storage vesicles to extracellular space. Figure 8. Simulations of effects of the combination of inhibition of dopamine transporter (amfonelic acid) and antipsychotic drug (haloperidol) on amount of dopamine in vesicle and extracellular compartments.